Has this ever happened to you? One morning you wake up and you realize that you have no closings, no prospective clients and no money? Many years ago, when I was just a fresh face with a real estate licence, I survived on credit. I would rack up huge credit card bills and then pay it all back the moment I sold something. Then the cycle would start again. It wasn’t until I developed a saving plan and prospecting strategy that I finally broke from the insanity of living hand to mouth. We are lured into the real estate business by quick and easy money. It’s not until a few months later that we realize it isn’t quick OR easy. Entrepreneurs are, by nature, risk takers, but successful entrepreneurs are also visionaries. They are motivated, determined, thorough, hard-working and above all, recognize that they need to reach people….a lot of people, and they need to do it everyday. It’s called PROSPECTING. Are you like Agent Steve? A few years ago he got his licence. He had been talking about it for a few years and, as a likeable fellow, he had a few friends that said they would buy through him when he was registered. His mother was also planning on downsizing so he had hopes of helping her out too. Out of the gate he bought two properties for his friends. He listed and sold his mother’s house and helped her find a small condo. In his first year he did four transactions. Feeling very proud of himself he thought he had lucked into a great part-time job which helped him supplement his other income as a manager at a printing company. With his new-found money he bought himself a little Benz and took the family on a nice trip. And then everything changed. Agent Steve found himself with nothing. Throughout the time that he was working with his mom and his clients, Steve forgot to prospect. He said he was too busy. So when everyone got settled into their homes he had no new prospects or clients. Steve when from hero to zero. A good entrepreneur (read Real Estate Agent) knows that when a cheque comes in you have to use some of it to reinvest in your business not buy yourself something pretty. They also know that you can’t put all your eggs into one basket. I have heard lots of stories of agents who have worked with clients for months trying to find a very specific home. They take up a lot of time but in the end they dry up and go away. We call it the “Hail Mary” approach. Two problems…first, the agent didn’t qualify them well enough and second, they didn’t prospect because they knew the payoff would be sweet. Double whammy. The lesson here is simple. 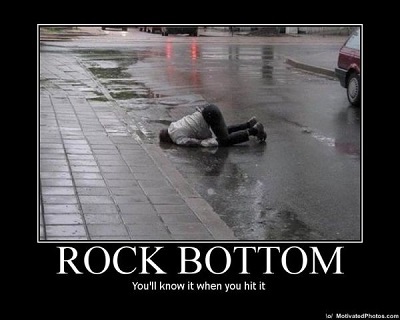 If you have hit rock bottom I can tell you with 100% certainty that you have NOT been prospecting. As crazy as it seems, prospecting, whether you love it or hate it, is the single most important job an agent has to do EVERY DAY! So when an agent tells me they have nothing on the go I know exactly why. The problem compounds very quickly too. Left with no money you start to stress about the rent. Life gets increasingly more difficult. So what can you do? First, prospecting MUST start at the office. Be present. Go to work every day and talk to the other agents there. Get open houses to do. I know that is tough to do when there is very little product on the market but talk to agents and see if they will extend their open house hours. Let them know you will do the noon to 2pm shift. Second, inspect property. Get to know your product again. You will get a lot of stuff to talk about. Third, call up your friends and ask them out for coffee. Catch up with them and slip in a few details about the market. Ask them if they know any body looking to buy or sell. Fourth, get out and take a course. Learning something always invigorates us. Finally, join a team or club. It’s a great way to meet people and network. I think it is important to recognize that real estate, in it’s most base form, is nothing more than a numbers game. You need to have 50 meaningful real estate conversations with someone in order to get one contract. Simple. The first step is getting up with a positive attitude. So if you want to sell 10 houses a year you need to have 500 serious conversations. That’s one a week and a couple on the weekend. When you break it down like that it doesn’t seem that hard to do.